This product is case packed in quantities of 120 per carton. A break carton fee of $11.00 will be applied to orders that are not placed in case denominations of 120 units. This double sided clip is made from stainless steel to provide a high quality display that will last for years to come at an extremely affordable price. 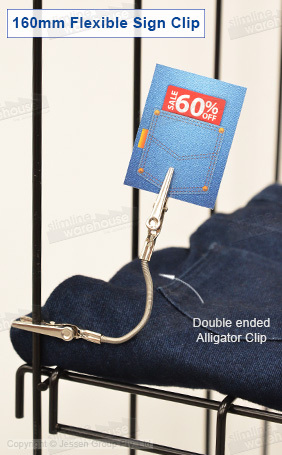 The alligator clip card holder has a 160mm flexible wire connecting the two ends, making it easy to twist the holder into a desired position to best be seen by visitors to your location. You can even place the wire at intriguing angles in order to create a more eye-catching display. This double sided clip, like our array of different restaurant displays, is great for use in cafes, bakeries, delis, and even retail stores or within an office. The alligator clip ends each feature serrated teeth to firmly grip both signs and items they are attached too. The dual-sided clip is useful because it doesn't take up additional counter space, able to be quickly attached to existing display items. Order today for use in offices, bakeries, cafes, retail stores, and more!